GRAS 40HT can measure sound pressure levels below the threshold of human hearing; and is amply suitable for sound-power measurements on even very quiet products. Its very wide dynamic range permits measurements down to below – 2 dB re.20 µPa (in 1/3-octave bands) from 20 Hz to 20 kHz. 40 HT is for low sound pressure measurements and very low sound power measurements. 40HT comprises a special high-sensitive ½-inch Condenser Microphone GRAS 40AH, a ¼-inch High-impedance Preamplifier GRAS 26HG with adapter GRAS GR0010 for the ½-inch microphone, and special Gain and Filter Unit GRAS 26HT. The Gain and Filter Unit and Microphone are an individually-matched combination. To complete the system, a special single or 10-channel power module (available from GRAS) is required, i.e. GRAS 12HF for single-channel measurements or GRAS 12HM for 1 to 10 channel measurements. 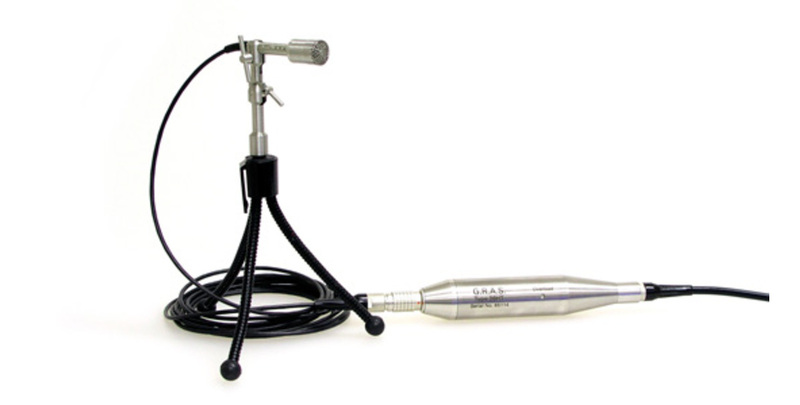 Each channel provides all voltages required for 40HT and polarizing its microphone. The Gain and Filter Unit GRAS 26HT has a built-in overload indicator (which is repeated on the chosen power supply) and a frequency correction facility for both pressure-microphone operation as well as free-field microphone operation. The chosen power supply has a two-position switchfor selecting which microphone operation to use, i.e.pressure or free-field. A typical free-field response for an angle of incidence of 0 ° is shown in the data sheet when the 40HT is switched to free-field operation. Also shown is a complete low-noise measuring system, a typical noise floor in 1/3-octave bands for both the linear and A-weighted cases.